Some people say Nile Bowie is more Russian than American but the fact is he's an American columnist with with the Russian Today who's made Kuala Lumpur his home, which I think makes him one of a kind. I've met him a few times before and after the 13th General Election and you can tell that he basically subscribes to Najib Razak's so-called transformation plans even if he's not wholly impressed by them. NB must have been following closely the just-concluded Umno election, which he has put on record as "Najib's most substantial reform thus far"; it'd be interesting to know what he thinks of the outcome. 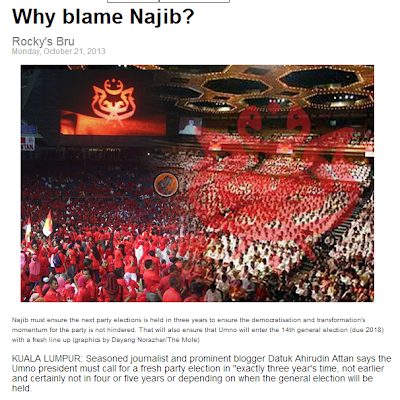 One thing for sure, NB wouldn't blame Najib Razak for the outcome of the election. And neither should we. There are a lot of blog and FB posts out there blaming the PM and Umno president for the "flawed" or "wrong" outcome of the election. I don't see the logic. We were all rooting for our own favorites (eg 521) but just because it didn't turn out the way we wanted it to, we must blame the man at the top? The new Umno election system - designed to be more transparent, more immune to money politics, and more democratic - should be used as a benchmark for all political parties in Malaysia. Instead of blaming Najib, we should pressure political parties - especially those holier-than-thou that have been guilty of appointing instead of electing de facto leaders - to walk the talk before talking about national reforms! 1. The party president must call for fresh election in exactly three year's time, NOT earlier and certainly NOT 4-5 years (or depending on when the General Elections will be) which has been the practice before this. This is most crucial because if Najib's transformation within Umno is to work, he has to ensure that the momentum of last weekend's election is not hampered by delaying the next one. A party election this time in 2016 will also ensure that Umno will go into PRU14, which must happen by 2018, with the best and latest line-up. 2. Aspiring candidates must (be allowed to) make known their intention much earlier. 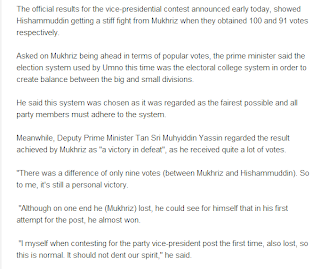 Mukhriz announced his decision "rather late", Akramshah Sanusi even later, and we only knew that Maznah Mazlan was taking on Shahrizat Jalil 10 minutes before nominations closed. The process should begin earlier, say 3-6 months before election. Winner should be base on Popular votes not COLLEAGE asUMNO is WARGA EMAS and going to be NENEK KEBAYAN coming soon. Be brave to accept POPULAR votes . Amazing how fast you've changed your tune and jumped over to the winning ship.....parasites true and true you dumno bloggers. Agree with Dato'. Those wanting to Contest should be allowed to campaign much earlier. ala Datuk Azlina. 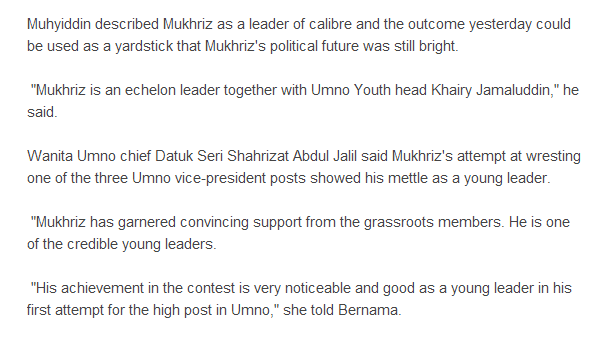 UMNO is more mature than many would things. You knows about Mr Party President. He delayed GE 13 until the very last day eventhough NS assembly dissolved by itself. Do you really think he going to call for another election? Why can't we blame Najib when the indications are clear that he wanted status quo in the VP race. I cannot imagine Hisham becoming next PM and KJ DPM. Every single votes count. Then its worth voting from grassroot members. Popular votes must be the deciding factor for a candidate to win any post. Credit where credit's due. DS Najib has opened the door for change, it is up to the Umno members to seize the day. And they did! 55,290 members voted FOR change aka Mukhriz. In the next Umno election, that number could easily double or treble. Change is the only thing constant and it's coming to this party. Umno's enemies who are hoping that the party will die of old age will cry. They are the ones who will die ... standing!! In the disbelief of many, it is no longer a myth that Najib as UMNO President did not interfere in the contests of several posts, namely Wanita Chief and VPs. I'm one of those without any doubt Najib issued 'instructions to maintain status quo'. 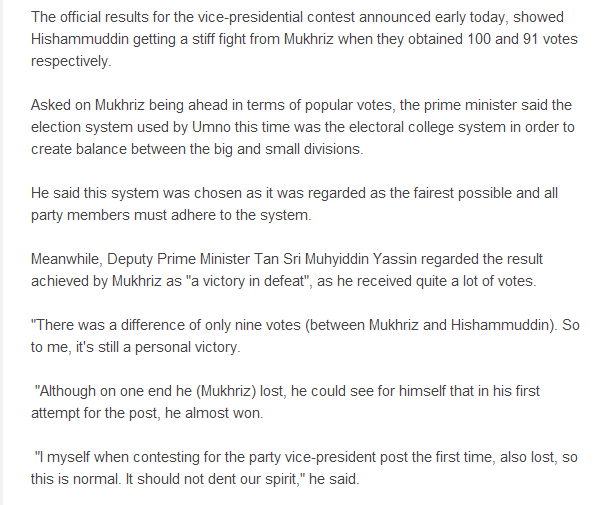 That explains why Mukhriz lost badly in Johor and Pahang to Hishamuddin. It is common knowledge Johor and Pahang have been giving strong vibes of support to Mukhriz in the run up to the actual polling. 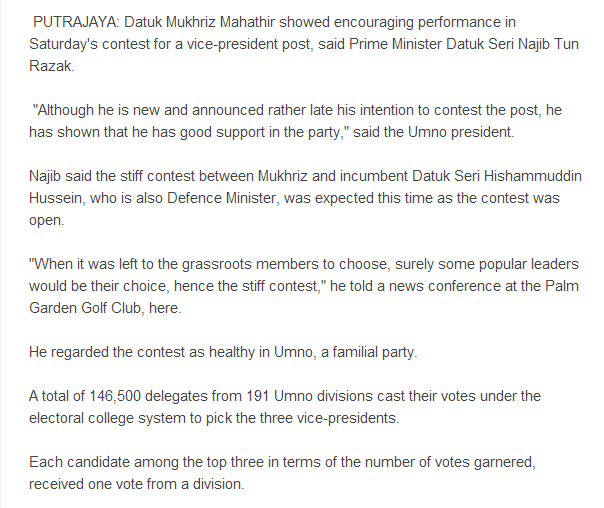 Probably Najib can fool himself and within the upper echelon of UMNO that maintaining is the best. Then again time and time Dr Mahathir been proven right. Maintaining 'status quo' is UMNO not listening hard enough to aspirations of the Malays. The current systemis easier to manipulate than the previous one. Aspiring candidates need only to take care of 198 power brokers at divisional level. To get UMNO members to get in line is not that difficult. Just dangle the carrots (projects, loan) or snap the whip (projects, loan, scandal). Plenty of those around. 1. Walaupun saya turut bersetuju keatas kedua-dua cadangan Datuk tersebut ianya hanya cantik diatas kertas saja. 2. Selepas 4 tahun memegang jawatan PM Malaysia tak kan Datuk tidak dapat membaca "body language" DS Najib. 3. Transformasi yang beliau hendak ketengahkan dalam pemilihan UMNO memburukkan lagi persepsi orang bukan UMNO terhadap UMNO. 4. Presiden parti telah memberi maksud (lebih kurang) bahawa transformasi UMNO hanya melibatkan pindaan akta parti/ pemikiran&minda ahli-ahli dan bukan semestinya fizikal. Oleh itu penyandang-penyandang jawatan sayap (kecuali Putri) dan NP dikekalkan. 5.Orang luar UMNO selama ini yang beranggapan transformasi itu adalah menyeluruh merasa tertipu dan kecewa. 6. Namun keputusan pemilihan sudah muktamat. Kita harus patuh. Samada akan ada lagi pemilihan UMNO pada 2016 dengan muka-muka baru bertanding terpulang kepada Presiden parti. 7. Satu peringatan penting kepada ahli-ahli UMNO yang akan menjadi perwakilan untuk pemilihan UMNO 2016 (kalaulah ada); pilihan anda adalah penentu samada menang atau kalahnya UMNO/BN pada PRU14.Kalau tiada pemilihan baru lagi inilah pilihan yang anda telah buat. Hendak salahkan siapa?